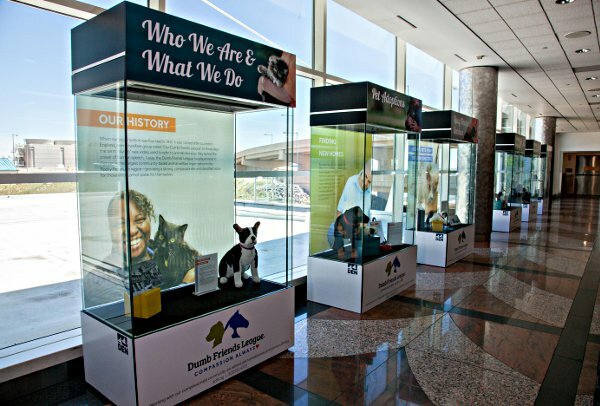 DEN's newest exhibit, in partnership with the Dumb Friends League, helps educate travelers about pet adoption and care. It features an overview of services by the Dumb Friends League, including pet adoption and a plethora of animal related services. Founded in 1910, the Dumb Friends League is the region’s largest community-based animal welfare organizations and has achieved one of the highest placement rates for homeless pets in the country. Exhibit display cases artfully highlight important services the Dumb Friends League offers such as pet adoption, equine adoption, animal protection and spay/neuter services. The unique and educational exhibit is inspirational and celebrates one of Colorado’s most compassionate non-profit organizations.